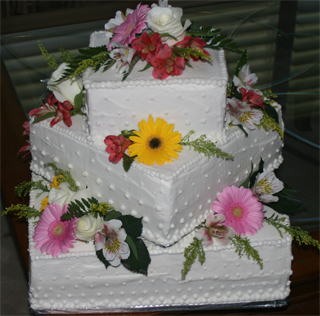 Alright,I have had a few people ask for pictures from my latest cake ventures. ;-P The first one (as you can read on the cake,) is Emily’s birthday cake. I wanted to try out my new pans (to be used for Shelly’s wedding cake, which is below.) 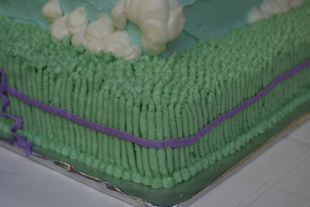 It went well, I made the grass but using a round tip like you would a star tip on the top, then just piping up the sides (from the bottom.) Nothing too fancy. Keers they look amazing!!! 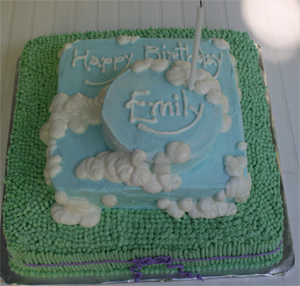 Emily’s cake is really cute and the wedding cake is great as well. AND it is okay to be normal and it is more okay to tell people that you are “normal”. I love you!!! Keep up the awesome work I love seeing what you will do next. Mmmm…Shelly brought over some of the leftover cake last night. It was delicious!